They're still not terribly fast, and they don't move terribly far, but I've arrived at the crucial step of getting artificial muscles to actuate something more than just a weight hanging from a string. First up, we have a heterochiral muscle (the type that expand when heated) flexing a piece of paper. 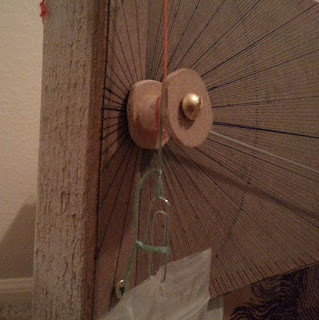 Each coil of the muscle is sewn to the paper on one side with a loop of thread, so the coils expand on one side and are constrained on the other, causing the paper to bend. This is almost a no-load movement, and strikes me as being most useful for something decorative, such as an artificial plant. You might notice that the cooling cycle is almost as quick as the heating cycle. I attribute that to chilly ambient temperatures in the upstairs laboratory. 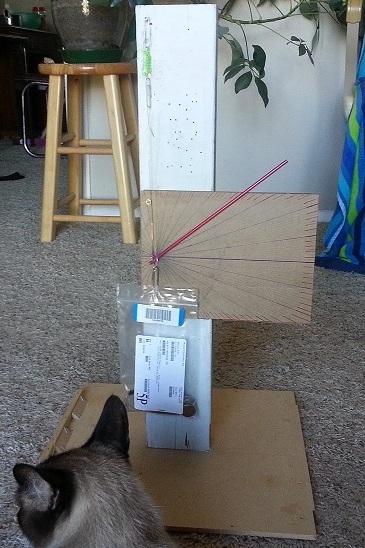 Next we have a homochiral (contracting) muscle, rotating a piece of cardboard on a hinge. The opposing force of the rubber band on the opposite side pulls the cardboard back into its original position during the cooling cycle. The homochiral muscle featured in the video has been annealed with some space between the coils when at rest, so it doesn't have to be put under tension in order to have working room. Both of these muscles are drawing about 1 A of current. They are made of Trilene Big Game fishing line, test strength 50 lb., diameter 711 um, with a heating element of 10/46 copper litz wire. The homochiral muscle has two strands wired in parallel. The heterochiral muscle was coiled on a rod of 3/16” diameter, while the homochiral muscle was coiled on a 1/8” rod. I determined in some previousexperiments that trying to spread the coils of a homochiral muscle when one first coils it on the rod is a bad idea. At this point there is a great deal of tension on the line – it wants to uncoil itself – and the coils don't cooperate very well. Coiling the muscle on a threaded rod is a possibility that I haven't tried yet; the spacing of the threads would limit the coil spacings one could achieve. I started looking at ways to adjust the coil spacing after the initial annealing. First, I tried putting the muscle under tension (with no rod in the center) and running a high current through the heating wire, hoping to anneal it into its new shape. This method gives the most even coil spacing one could ask for, but the amount of heat applied to the muscle was only sufficient to “soft-set” it. 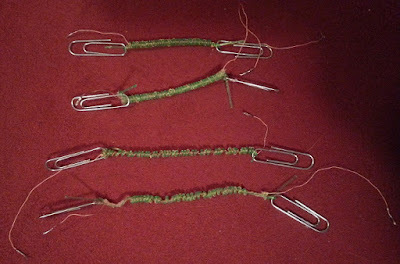 I noticed that as it sat around for a few days, the coils slowly returned to their original close-packed configuration. When I tried annealing a muscle under tension at full heat in the oven, without a supporting rod in the center, the coils just went flat. In the end, the best method I found was to put the muscle through its first annealing phase, manually spread the coils on the rod, then anneal it a second time. It's a little tedious – friction holds the coils against the rod, so you have to slide each one into the right position with your fingernail to get the spacing even – but it seems to work. 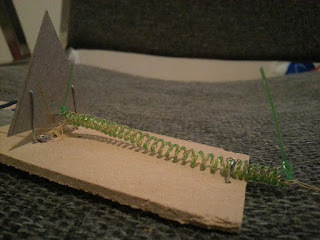 In addition to artificial muscles, you can make simple passive springs by coiling nylon monofilament around a rod and annealing it (without primary twisting or a heating wire). The spring constant is determined by the thickness of the filament (larger diameters yield larger constants) and the size of the rod (smaller diameters yield larger constants). I got rather excited about this a few months ago, thinking I'd never need to buy a spring again. The problem is, these plastic springs don't necessarily hold up well. I took that video the day I finished building the leg. A few days later, the leg was in sorry shape, merely because I had allowed my house to heat up in the afternoons. 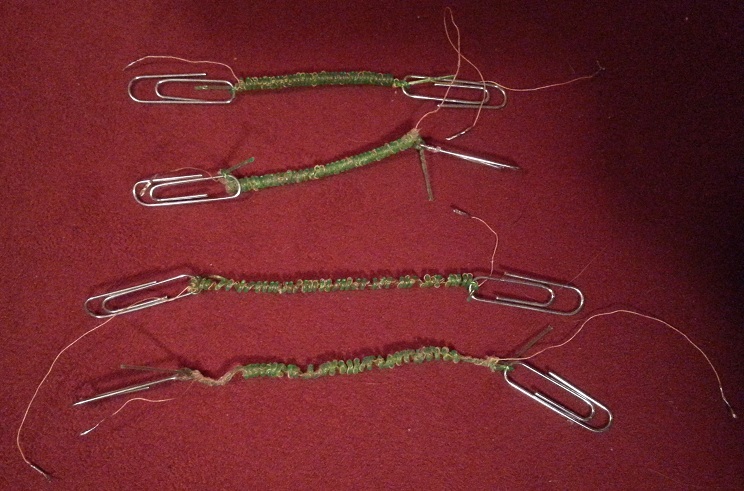 This was sufficient to make the springs relax a good deal, so that I had to shorten them to get the same degree of tension I had before. Naturally, this leaves me in some concern about the muscles as well. How might they be affected by high ambient temperatures? I haven't done any tests in which I compared a muscle's performance across many sessions of operation, with temperature spikes in between. Comments now require moderator approval, because spammers have been really junking up the place. Sorry. In the new year, I think I'm going to try to build an “artificial muscle summary” page featuring everything I've learned, for the benefit of others who want to experiment. Once that's done, I may set muscles aside for a while. There are soooo many other things I want to work on. Have a most excellent New Year! DA:O did an excellent job of creating a living fantasy world that I actually felt part of. I could believe myself a Grey Warden, a powerful figure sworn to protect the world from an ancient evil. But the part that has really stuck with me from this story is the amount of free will I had as an actor in it, its propensity for pushing me to make choices in nuanced situations, and its mature take on the results. I'm used to wish-fulfillment from this genre -- games that let me craft the perfect hero story, and if they include much tragedy at all, make it inevitable and not my fault. DA:O is a bit different. I was kind of naive at this point. Example: this world has golems in it. Awesome. As I dug deeper, I found that the way they are made in this setting is ... not awesome. Eventually, I was faced with a choice: preserve this dread technology and hope against past experience that someone would use it wisely, or discard it, possibly eliminating golems from the world forever. I opted to destroy the means of golem creation. As much as I love golems for reasons of both personal fancy and practicality, there were more important things to preserve here. And this was not the most painful decision the story required me to make, by far. Thanks to a combination of numerous options and different ways for players to interpret the story, the endgame of DA:O is going to be unique for every person. For me, the path I had followed through earlier parts made it especially pivotal, and having put emotional hooks in me, the plot seemed intent on exploiting them. I was offered the perfect fairy-tale ending ... the one I had been hoping for ... at the price of a couple of sketchy choices. Alternately, I could do what I thought was truly best for the world I was trying to save, but only by giving up what I wanted most in that world. I chose the latter, and the consequences landed. There was no miraculous deliverance, no last-minute "power of true love" or "good karma" or surprise rescue to fix everything. It was miserable and incredible and different from any other game experience I've had. 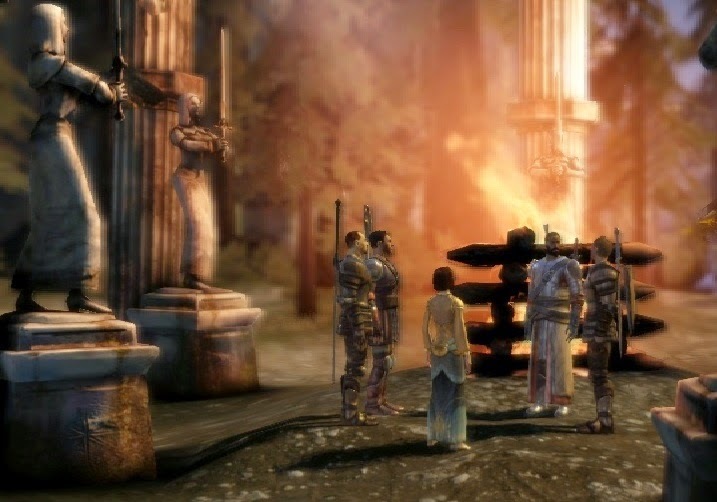 Dragon Age actually made me pay to be a hero, and the payment was my choice. Whether literally or figuratively, real heroes bleed. A lot. Some part of me wants to replay the game as a slightly less scrupulous character. I could throw self-sacrifice to the winds and get that ending I really wanted. "It's just a video game, you know," says this part of me. "You can do that. You won't actually hurt anything." But whenever I start thinking this way, a second part of me warns that doing this would cheapen the whole experience. As soon as it becomes "just a video game" rather than a world that I embrace on its own terms, I will have lost what really makes it meaningful. As soon as I stop thinking of it as a place where I make morally relevant choices, I won't be a Grey Warden any more. I'll be nothing but a petty escapist, playing at being a hero without caring what's actually involved. And at the end of the day ... that's not what I want. 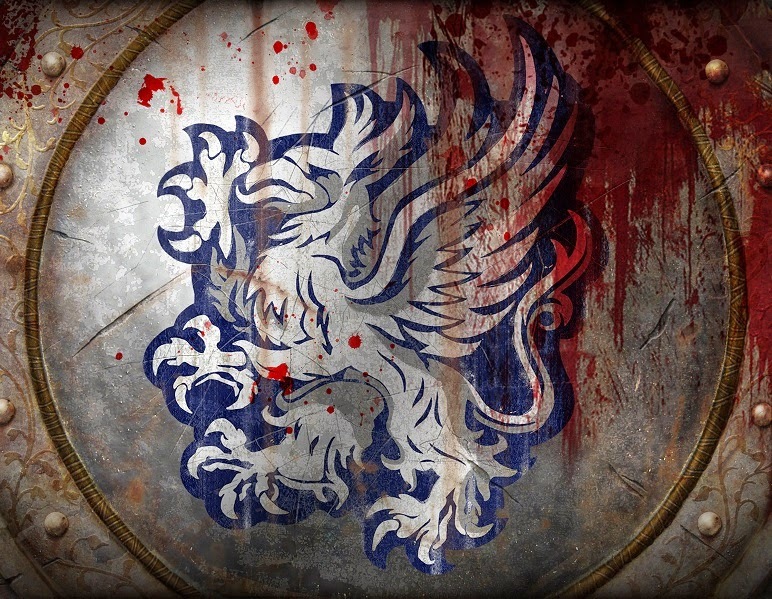 What I want is to wear my heraldic griffon shirt and feel that in some tiny way, I earned it. I haven't forgotten about the artificial muscles and other robotics projects, I swear. Thanks for your patience.